We are leaving for Umbria Wednesday, so I will be closing down my kitchen tomorrow. It has been an interesting past couple of weeks as I did my best to eat up most of what I had in my refrigerator and freezer. I must admit though that we had a few odd meal combinations, but I am almost there. One thing I always have in my freezer are skinless chicken thighs that I buy in bulk from Costco. I love chicken, but thighs in particular always seem to remain moist and flavorful. One recipe I threw together this week that turned out great was this easy one for chicken thighs that are seasoned with fresh ginger, lemon, and honey. We cooked our thighs on the stove-top because my husband had already shut down our outdoor grill, but they would be amazing grilled as well! Grate the peel from the lemon, and combine it in a bowl with the ginger, red pepper flakes and salt. Squeeze the lemon, and mix the juice in another bowl with the honey, soy sauce, and 2 teaspoons of water. Rub the lemon and ginger peel over the chicken. In a large frying pan, heat the oil until lightly smoking over medium high heat, then brown the chicken well on bother sides, about 10 minutes in total. 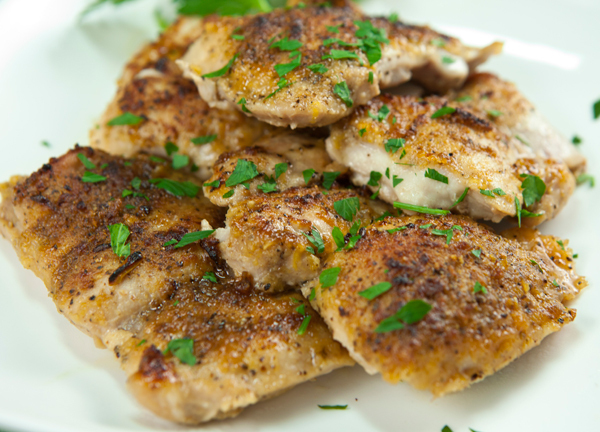 Pour the lemon juice mixture over the chicken, reduce the heat to low, and continue to cook the chicken until done, about 14 to 18 minutes. 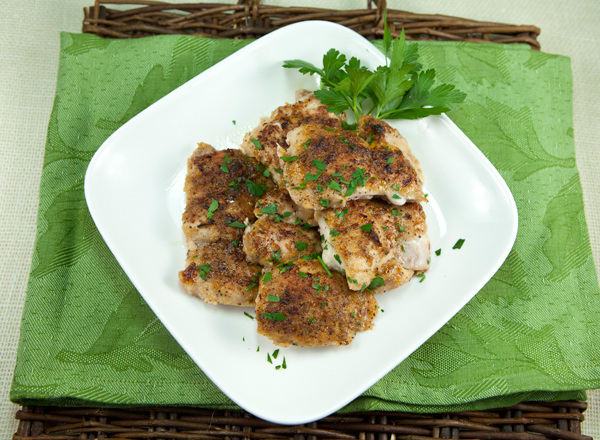 Place the chicken on a platter and pour the sauce on top and garnish with the parsley or cilantro.